The PL-1200 vertical shaft sand crusher is the key equipment for the concrete mixing system. The vertical shaft rotor of the pulverizer transmits the gravity of the entire rotating part to the vertical shaft rotor through the transmission system, and all the gravity of the rotating part is supported by the supporting wheel and the rotating pair, and the vertical shaft rotor body is axially rotated to crush the stone. The dam artificial aggregate system of the Sichuan Xiluodu Project of Gezhouba 5 Company uses the PL-1200 vertical shaft sand crusher to crush the aggregate. The vertical shaft has a diameter of (2650Â±1) mm, a wall thickness of 125 mm and a weight of about 1500 kg. The vertical shaft rotor is made of ZG40Mn. The vertical shaft rotor runs for a long time in the environment of high temperature, high dust and sudden change of force. It is prone to large-area fracture phenomenon, and is generally repaired by welding method. In March 2010, the Gezhouba Five Company Sichuan Xiluodu Project Department dam artificial aggregate system PL-1200 vertical shaft sand crusher found cracks on the side end of the vertical shaft rotor of the crusher after running for 4 months. From the outer surface, The crack depth has been cracked from the outer surface to the bottom, the axial direction traverses the vertical axis surface, and the length is 145 mm; the other side inner crack length is 89 mm. (1) Due to the uneven force applied to the force during feeding, the vertical shaft carries alternating loads of different amplitudes, and the cracks often occur under alternating loads of different amplitudes, and the crack propagation is small at the initial stage and then gradually becomes larger. (2) The vertical shaft itself has certain processing defects, which are reflected by the deterioration of operating conditions. (3) During the operation, the vertical shaft generates friction with the shaft seat fixed on the machine body, so that the matching clearance between the vertical shaft and the shaft seat increases, and the vertical shaft sways along the axis of the vertical shaft. The vertical shaft of PL-1200 vertical shaft sand crusher is made of ZG40Mn medium carbon cast steel. Its chemical composition and mechanical properties are shown in Table 1 and Table 2. It can be seen from Table 1 that the material has a high carbon content and is prone to hardened structure. The vertical axis crack has a thick cross section and is prone to weld cracks. According to the analysis of ZG40Mn welding performance, electrode arc welding was started, and EDPMn2-16 electrode was used for layered welding. After about 1 month of repair welding, the weld site re-cracks. Due to the crack in a short time after welding, the welding cost is high, resulting in a large waste. Through continuous testing, taking into account the comprehensive factors such as the mechanical properties of the welding rod and Z G40Mn, the causes of cracks, etc., the combination of CO 2 gas shielded welding and electrode arc welding is used for repair welding. When the bottom layer of the welding operation is used, f3 is adopted. .2m m stainless steel electrode (E308H-16) is primed, then filled with CO 2 gas shielded wire (ER50-6) and wear-resistant tungsten carbide electrode (EDPMn2-16), and a reasonable layer sequence is used. . After welding, the vertical axis of the vertical shaft sand crusher has a crack time of 12 months. Due to the use of gas shielded welding, the welding time is saved, and the cost of the surface weld electrode is also greatly reduced. 3 is shown. (1) Groove form To meet the requirements of the construction period, reduce the filling amount of the welding rod, and select a smaller groove angle and a U-shaped groove. Before the opening, a 30mm Ã— 10mm steel plate is used as a reinforcing member to weld to the outside of the vertical shaft to prevent cracks from changing during welding. The groove width is 45 mm Ã— 45 mm, 35 mm Ã— 41 mm (weld width Ã— weld thickness). The groove is processed by carbon arc gouging, the groove is cleaned, and then the coloring inspection is carried out. After the defects are found, the defects are processed in time to meet the working conditions required for welding. (2) Preparation before welding 1 Turn the vertical shaft to the position where welding is easy, and the flat welding method is often used. 2 Set up the windshield to avoid the influence of external factors on the gas shielded welding operation. 3 Applying a welding process plate around the U-shaped groove without affecting the welding surface of the vertical shaft crack to prevent welding cracks during welding and after welding. The plate material is Q235 plate and the thickness is 12mm. 4 pre-weld preheating and post-weld heat treatment. 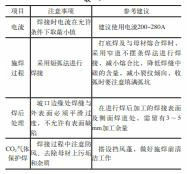 According to the analysis of ZG40Mn welding performance, in order to prevent weld cracking during and after welding, the vertical shaft should be preheated before welding, and the temperature should be controlled during welding (see Table 4). (3) Welding parameters The welding machine is made of ZX-500, Ï†3.2mmE308H-16 stainless steel electrode, and the electrode is dried before welding. The drying temperature is 250 Â°C, the drying time is 2h, and it is placed in the portable welding rod incubator for drying, and it can be used as needed. The specific welding parameters are shown in Table 5. (4) Welding process The specific welding process is as follows: bottom welding: Ï†3.2mm E308H-16 welding rod, welding current 90~100A, DC reverse connection. Slow and short arc welding is used. The thickness of the bottom layer is 6mm. When the arc is closed, the arc pit is filled to ensure that the vertical shaft base material is penetrated. After welding a welding rod, the weld seam is hammered immediately to release the welding thermal stress. Welding of filling layer and cover layer: The welding filling layer is first protected by CO2 gas, the welding wire is ER50-6, and the welding wire covers the surface of both sides of the base material by 3.5 mm. The filling layer adopts the combination method of ER50-6 welding wire and E308H-16 welding rod, that is, firstly welding a layer with CO2 gas and then welding one layer with E308H-16 welding rod, then hammering the welding seam, the welding current is 200~280A, Short arc welding is used for welding to control the temperature between the welding layers between 280 and 300 Â°C. When the interlayer temperature is >300 Â°C, the welding is stopped immediately. After cooling, the welding is continued. The cover layer is made of wear-resistant tungsten carbide electrode (EDPMn2-16). When the temperature is >240 Â°C, the welding is stopped immediately. The specific parameters are shown in Table 6. Welding sequence: When welding, the welding sequence as shown in the drawing is used, and the generated lateral and longitudinal residual stresses are small, which is beneficial to suppress the rapid increase of temperature during welding and welding. CO2 gas shielded welding has a large penetration depth. During the welding process, when the welding gun is oscillated laterally, it is necessary to ensure a certain penetration depth on both sides of the groove, so that the weld bead is flat and has a certain concave shape to avoid the intermediate protrusion, so that both sides of the weld bead Forming an angle with the groove surface, causing defects such as incomplete penetration and slag inclusion. To control the thickness of each layer of weld bead, make the weld bead of the front bead of the cover bead 1.5~2.5mm lower than the base metal, and ensure that the edges of the bevel cannot be melted, so that the groove can be seen when the cover is The cover creates good conditions. When welding the cover, the surface of the previous layer should be flattened before welding. The amplitude of the welding gun swing is larger than that of the filling layer. The amplitude should be the same when swinging, and the speed should be uniform. Pay special attention to the melting of both sides of the groove. Ensure that the edge of the weld pool exceeds the edges on both sides of the groove and â‰¤ 2 mm to avoid undercutting. If multiple welds are used for each layer, the wire shall point to the angle bisector of the weld bead and the groove, weld bead and weld bead. (5) Precautions for welding The specific precautions are shown in Table 7. (6) Post-weld inspection The weld was visually inspected 24 h after welding, and no defects such as cracks, pores and slag inclusions were found. 100% coloring inspection of welds without weld defects. The process has been practiced many times, confirming that the process performance is good and the production cost is reduced by 10% compared with the conventional process.